Comments: Evergreen flowering tree native to eastern Australia. White paperbark trunk with narrow dark green leaves. Trees can grow to 25' and are broad spreading. 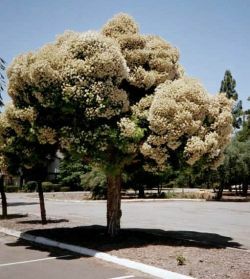 White flowers cover the tree in late Spring or Summer. Excellent tree to plant under power lines due to low growth.